Berguen lies on the Albula pass road 1’376 meters above sea level. 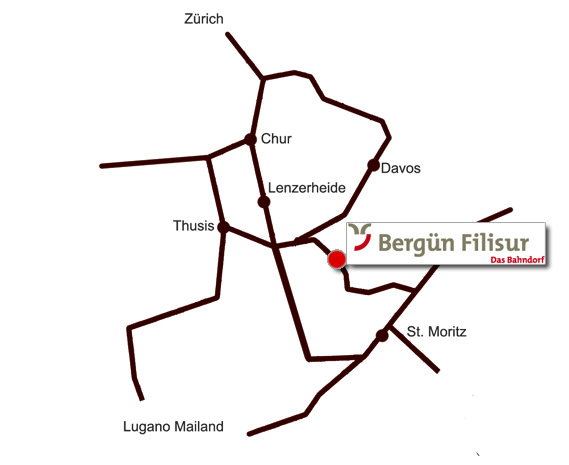 Take the Swiss Federal Railway (SBB) up to Chur and continue with the Rhätische Bahn (RhB) by the famous Albula line and the Landwasser viaduct to Berguen. Coming from Tiefencastel you will find at the village square on the left. From the Engadine you drive down through the village to the village square. Here you will find us on the right side. Behind the hotel there is ample parking.